Courtesy of Jim Anderson, Waikiki Swim Club, Hawaii. The Waikiki Swim Club has been going strong in Honolulu, Hawaii since the early 1970s. With the guidance of Jim Cotton, Virginia Moore, Wayne Umeda, Virginia Enos, Fred Middleton, Dorie Lalroix, Eve Anderson, Yoshi Isa, John Cater, Natalie Naugle, Tom Mahoney, Marilyn Graper, Lou Herman, Suzanne Kashiwaeda, Karl Storz and Kay Ney were the first members of the Club in October 9th 1971. 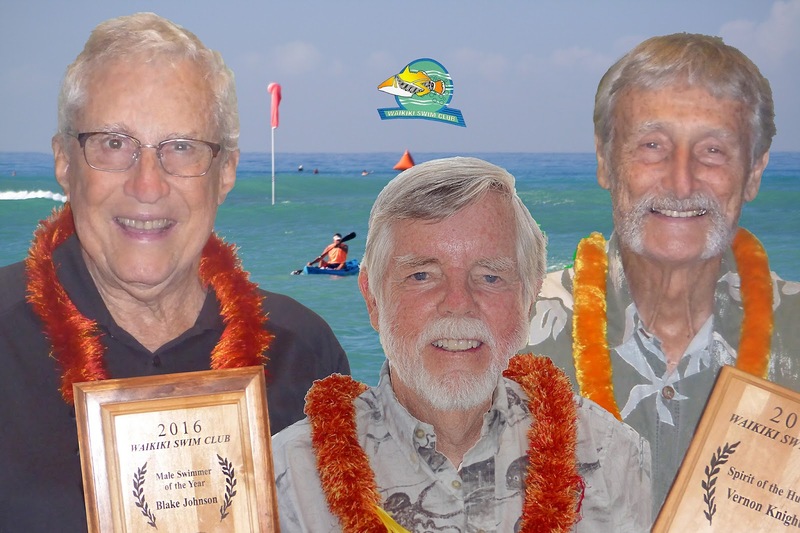 Under the auspices of Waikiki Swim Club President Jane Stites, the 2017 Waikiki Swim Club meeting was held and its annual awards were given out. It was the year of older men. 79-year-old Blake Johnson [shown above on left] was given the 2016 Male Swimmer of the Year award. 81-year-old International Marathon Swimming Hall of Fame inductee Jim Anderson [shown above in middle] was given a Life Membership in the Waikiki Swim Club. 82-year-old Vernon Knight [shown above on right] was given the 2016 Spirit of the Humu Award.